Aakanksha, notes! : My Birthday Gift. 2 months & 2 new metros to live in far from home.. & damn I now know why they say answer your interviews seriously coz' I had no idea then, that when exactly an year back as I boasted in my HR interview how I love traveling, they will take it so seriously. So here I am in the supposed to be 'city of Joy', the land where the sun rises up so early & I reach my office almost around mid day.Landing to this totally new city on a day when I would have rather preferred celebrating turning 22 is again like what they say ' Bad Coincidence ' ! 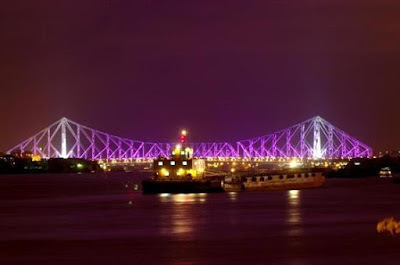 Yellow taxis & the howrah bridge, the sweet Rasogullas & the generous Bengalis, the old trams & the beautiful hooghly.A week in Kolkata & 4 months out of college,life is getting more adventurous than what I could have ever imagined..!It teaches me more lessons & I finally learn that there are more to learn. Reading your comment, I now realize how positive my post sounds ! I smell a contradiction in your post and your actual thinking...I was just trying to live the moment you might have lived..i know how it feels to be at a new place sometimes..you know lots of people but still there's a lonliness which you can't explain and it wasn't there when we were in hostels.. everything seems to be very superficial..
:D.. Arey baba i was serious...:D :P.. mood mai tha..